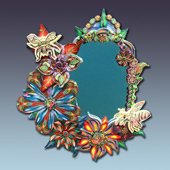 Sweet little mirror with polymer clay flowers created with the millefiore technique by Layl McDill. Little bees are also in clay created from Layl's drawings with the transfer technique. Hange one inch from wall with clay support and wire.